?Anniversaire Royal Oak Italie? Audemars Piguet, Genève, "Automatic?, Ref. 15128ST. 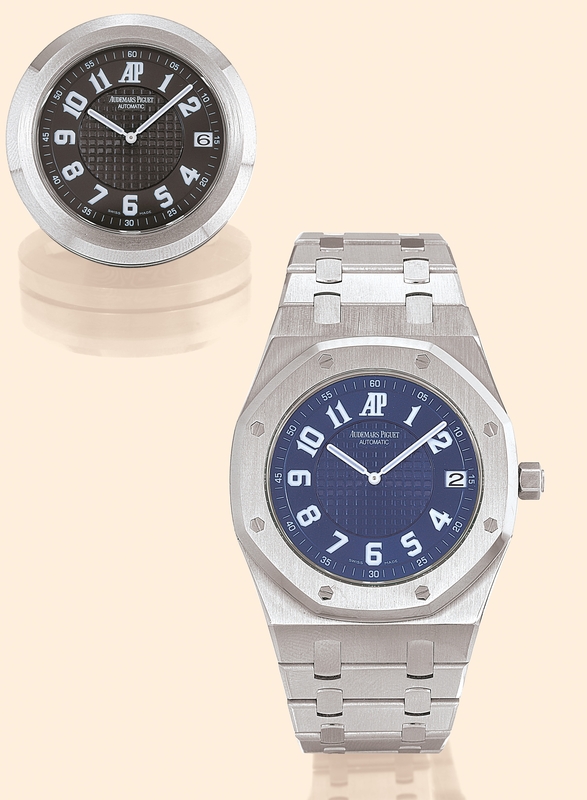 Made in a limited edition of 50 units for the Anniversary of Royal Oak Italie. Very fine, large, octagonal, self-winding, water-resistant, stainless steel gentleman's wristwatch with date and an integrated stainless steel link bracelet with stainless steel clasp. Accompanied by a fitted box, a certificate and an additional green dial. C. Three-body, polished and brushed, case back and bezel secured with eight hexagonal gold screws and nuts, transparent case back, screwed down crown, flat sapphire crystals. D. Blue ?tapisserie? with inner "clou de Paris" decoration, luminous Arabic numerals, , outer minute division, aperture the date at 3. White luminous ?bâton? hands. M. Cal. 2385, rhodium-plated, "fausses côtes" decoration, 37 jewels, straight line lever escapement, monometallic balance adjusted to heat, cold, isochronism and 5 positions, shock-absorber, selfcompensating flat balance-spring. Dial, case and movement signed. Diam 39 mm. Thickness 8 mm. C. Three-body, polished and brushed, case back and bezel secured with eight hexagonal gold screws and nuts, transparent case back, screwed down crown, flat sapphire crystals. D. Blue tapisserie with inner "clou de Paris" decoration, luminous Arabic numerals, , outer minute division, aperture the date at 3. White luminous bâton hands. M. Cal. 2385, rhodium-plated, "fausses côtes" decoration, 37 jewels, straight line lever escapement, monometallic balance adjusted to heat, cold, isochronism and 5 positions, shock-absorber, selfcompensating flat balance-spring. Dial, case and movement signed. Diam 39 mm. Thickness 8 mm.